Ekso is the first generation of intelligent, bionic exoskeleton that augment strength, endurance and mobility to help people with lower extremity mobility weakness or paralysis. These include individuals who have spinal cord injuries, MS, Guillian Barré or other neurological disorders. Ten leading U.S. rehabilitation therapy institutions have collaborated with Ekso Bionics to introduce this forward-thinking and innovative technology. 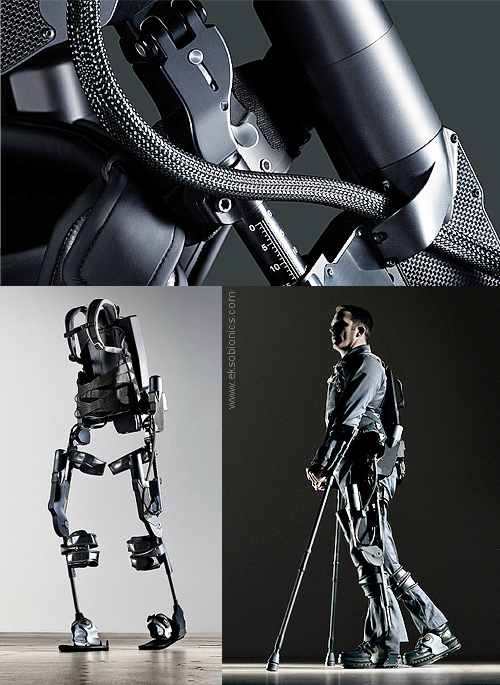 Its adjustable titanium frame encases the legs, with straps around the body and a computer with two batteries sits as a backpack, powering four electromechanical motors that propel the legs. Making use of 15 sensors placed around the body, an intelligent algorithm detect how the user wants it to move and signals the legs to replicate walking by bending the user’s knees and lifting their legs with what the company claims is the most natural gait available today. The frame supports itself by transferring the weight completely to the ground. The form-fitting profile maneuvers through doors and corridors, can sit in most ordinary chairs and can be put on and taken off in a few minutes with a bit of practice. Ekso is currently limited to rehabilitation centres but it is just a forerunner of what the company says eventually will be lighter and more adaptable systems for private use.